UFS Synthesizable VIP is compliant with JESD220B UFS specification and verifies UFS devices. UFS is build on top of it to make it robust. 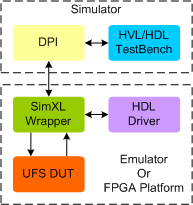 UFS Synthesizable VIP provides a smart way to verify the UFS component of a SOC or a ASIC in Emulator or FPGA platform. The SmartDV's UFS Synthesizable VIP is fully compliant with standard JESD220B UFS specification and provides the following features.